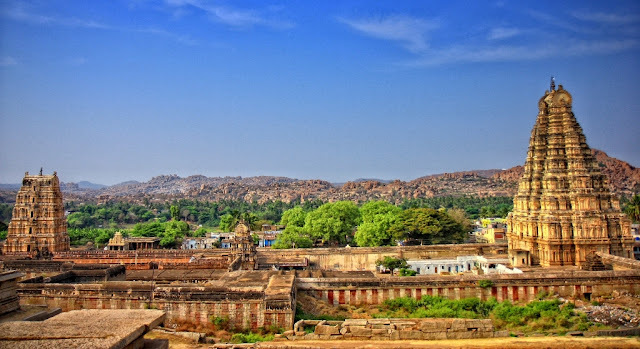 "The city of Bidinagar (Hampi- Vijayanagara) is such that, the pupil of the eye has never seen a place like it, and the ear of intelligence has never been informed that there existed anything to equal it." Abdul Razzaq - an envoy from Persia wrote about Hampi in 1443. He witnessed the architectural splendors, prosperous markets and the artistic and cultural progress of Vijayanagara during his visit to Hampi. It was during the years when Vijayanagara empire was at its summit of glory. 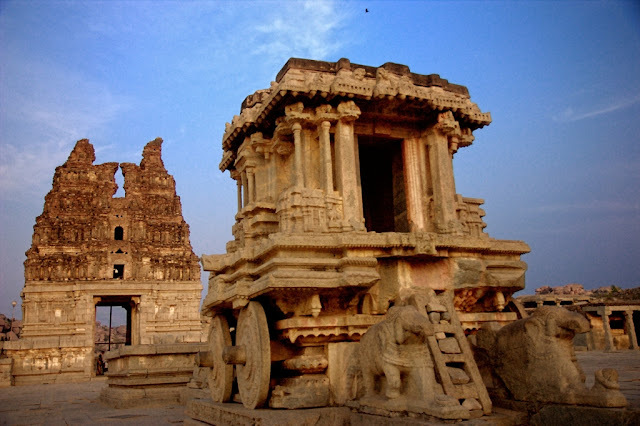 The present day Hampi, located in the Bellary district of North Karnataka quite extensive with its ancient temples and the royal enclosures and ruins of a city, which was in the late 14th and early 15th centuries, one of the richest cities in the world. This itinerary of Hampi covers all important destinations of Hampi in a course of 3 days. Each day is planned in such a way that the route follows a logical order. The main attractions of Hampi can be categorized into: The Sacred center, The Royal center and the Thungabhadra river trail. On the day 1, we would cover the most important temples in the sacred center of Hampi. The route which we are going to follow is below. We start at the Virupaksha temple and end the tour at the Uddana Veerabadra temple. Virupaksha temple is one of the most visited attractions in Hampi. The temple gets a large influx of tourists and pilgrims due to its religious, architectural and historical importance. It is an ideal landmark to start the Hampi itinerary. "Virupaksha" is a form of Shiva. The name "Virupaksha" means one with oblique eyes. The most striking feature of Virupaksha temple is its 50feet tall Gopura(tower) located at the west end of the broad Hampi bazaar. 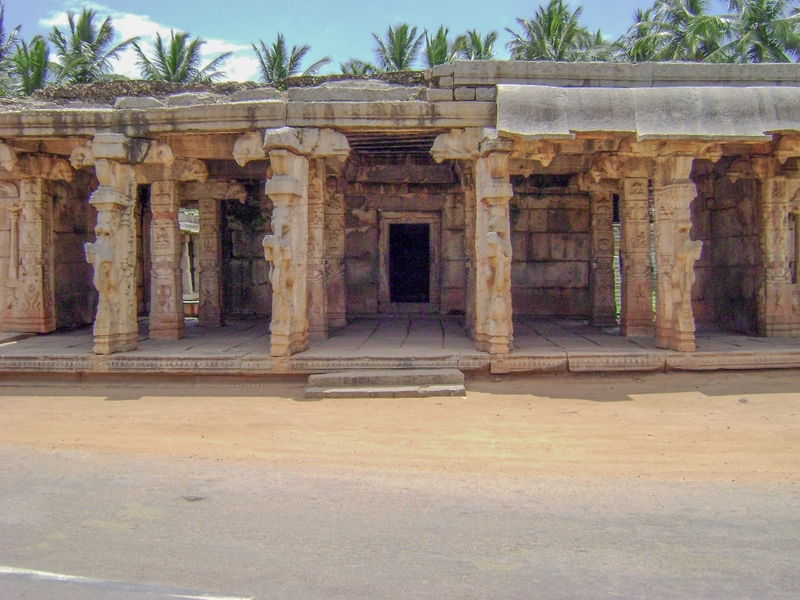 At the west end of the Hampi Bazaar, the Gopura of Virupaksha temple is located. It is an imposing structure in white color which serves as the prime entrance into the temple. 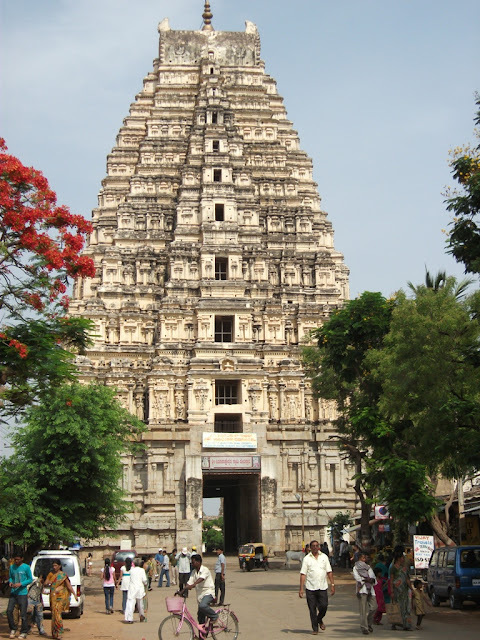 Though the origin of Virupaksha temple dates back to 7th century, the main Gopura is a relatively new structure. Even though the name of the patrons are not known, the Gopura has undergone major restructuring in the 19th century. Once we exit the Virupaksha temple and take an immediate right, one can see the flight of steps leading to the group of Shrines located on the Hemakunta hills. 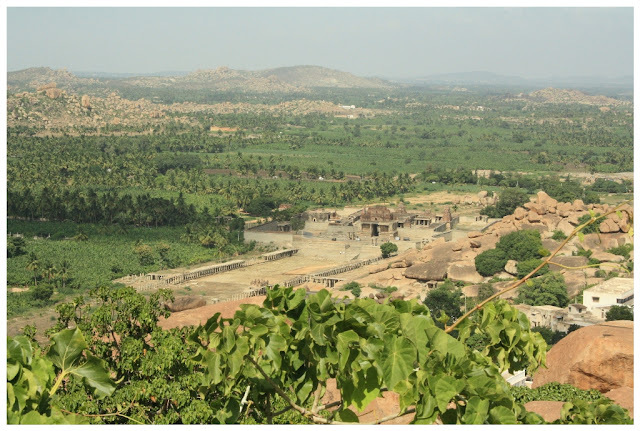 Hemakunta Hill is an ancient fortified region with multiple temples from Viayanagara and Pre-Vijayanagara period. Hemakunta hill was once secured with surrounding walls and gateways. Bala Krishna temple (the temple of infant Krishna) is located around 500 meters from the Hampi Bazaar. 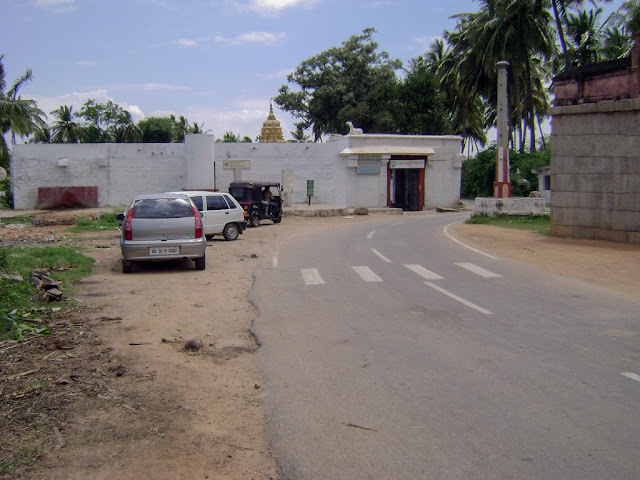 This temple was the center of the Krishnapura quarter of the sacred center. The grant gopura of the temple is in ruin, however it clearly coveys the royal splendor it had in the past. To celebrate his conquest of the Gajapati rulers of Odisha,Krishna Devarayar built the temple in 1515 AD. Also there was another reason for building such a grandiose temple. It was to accommodate the idol of infant Krishna that has been captured from the Udayagiri Fort (In present day Andhra) during the military campaign. After visiting the Balakrishna temple, you can come back to the main street - Hampi Bazaar near the Virupaksha temple to have food. As the noon time would be very hot in Hampi, make sure you carry enough water during the course of your afternoon travel. The Lakshmi-Narasimha statue is located quite close to the Bala Krishna temple. It is the biggest monolithic sculpture in Hampi measuring 6.7 meters high. It depicts Narasimha – the half man, hald lion form - the fourth Avatar of Vishnu sitting in a yoga posture. Due to it's fierce appearance, this statue is known as "Ugra-Narasimha". Even though the exact time line of this statue is not well known, an inscribed stone slab found near the statue mentions that the King Krishnadevaraya has commissioned this statue in 1528. Narasimha has a fierce expression on his face, which is aggravated by the protruding eyes. Above the Narasimha statue, we can see a multi headed serpent with a monster mask; it indicates the Adi-Sesha, the serpent of Lord Vishnu. We conclude our day 1 with a visit to Chandikesvara Temple and Uddana Veerabhadra Temple. Chandikeswara temple is a 16th century construction which is dedicated to Lord Vishnu. It is currently abandoned and in complete ruins. 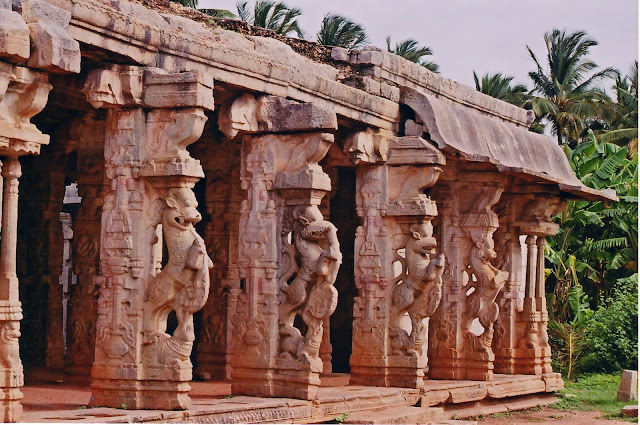 However the finely carved Matapa in front of the temple with “Yali” pillars is of particular interest. “Yali”, is a fierce mythical creature which has a leonine face, protruding eyes and fangs. As we enter into the Chandikeswara temple, we see an empty sanctum however near to the sanctum we can see a crudely built chamber in which there is an idol of Goddess Kali. The idol is having two hands, in which she holds a rice ball and a ladle. This form of Goddess Kaali is particularly striking as Kaali is most often depected as a warrior goddess with fierce weapons in her hands.